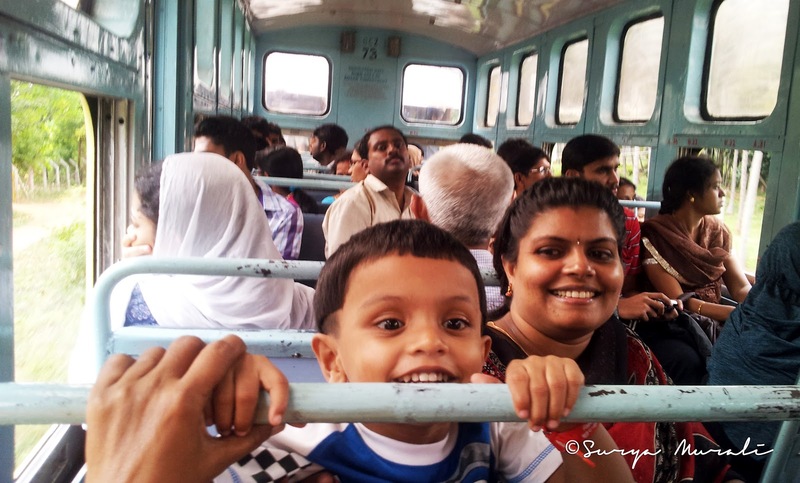 A Trip to Ooty – Part 1 – Flawed, Cracked… But Rare! Arrrgh… ok… lemme kick-start the machinery again. And what better way than to try and remember a recent trip I had to Ooty. Yeah, it wasn’t that great and I don’t recall much. Either all the movies are shot in an Ooty that’s totally different from the one I saw or something is wrong with my onscreen and off-screen perception of places. Yes, it was green and misty and foggy and whatnot… but it was also too wet and too crowded for me to like the place. And mind you… we had gone when it was supposed to be off-season. I shudder to think of how the place would be during peak season when everyone would be Ootying. To that existing crowd we added a good 18 more people. Oh yeah! When we travel, we travel khandaan in tow! In a Sutlej 30-seater coach. With luggage that most families pack for a month. For 3 days. Oh… by the way, when I said ‘without clothes’… I didn’t mean nekkid… I meant I had clothes only for a week and they were all “Dry Clean Only” which meant that I had to buy more stuff!^^ So, I was clothed… just not happy wearing clothes bought with money meant for books. ^^Dry cleaning in Kerala takes donkey years! Around two weeks prior to the trip my cousin sis and I were trying to work out an itinerary to fit in all possible touristy spots into a period of 3 days. This resulted in the two of us doing a virtual tour of Ooty and its surroundings all the way to Mudumalai sanctuary to one side and Kotagiri to the other. Google Earth and Google Maps helped us a lot… but the weathermen did not. To decide whether we needed to pack our winter-wear and how many warm clothes to pack, we tried to find a reliable weather forecast for Ooty. When the packing started, the weather was forecasted to be a sultry, humid average of 25°C with thunderstorms… which made us (sorry, Just me) wonder if I weren’t better off huddling under the blanket in the house in Kochi which was a cool 22-23°C. A week later the weather was forecasted to be a chilling 10°C – 14°C, so I panicked and rang up mom to ask her to get me my coat, but she was travelling to Bangkok before flying down to Kochi and so no coat for me. With 4 days to the trip, the weather was supposed to be a tolerable average of 23°C and I was glad I wouldn’t need to carry my coat. We set out late one night in the last week of August, with the neighbors believing we were shifting for good, to Mettupalayam in the Sutlej. The Bangkok trippers (my uncle & aunt from Kuwait and mom & papa) had all reached Kochi on the day of the Ooty trip with just 5 hours to repack. Bade-papa’splace was turned upside down with all of us packing and re-packing, and with badi-maa in the kitchen preparing food for all of us and to be carried to Ooty (Apparently, people in Ooty survive on pure, cool and clean air and nothing else) the house was quite a mess. The smallest bag I could find was my cabin suitcase and I threw in a pair of jeans and 3 tops for the three days we would be in Ooty, along with my bare essentials, a Gatsby cap and a woollen scarf (my only protection from the anticipated chill)… oh and a pair of sneakers which I had bought for the trip because the only other footwear I had was a pair of 4 inch wedges. I had hunted low and wide for a decent camera to take along but in the end settled for my trusty Galaxy S2… also, uncle was going to get his Canon Rebel T2i. We were all packed and ready by half past ten in the night… even the two little ones. The living room was a sea of baggage, some of which included pillows and blankets. Don’t even think of asking me why! One corner was cordoned off for food items… snacks for the bus, idli and dry-chutney and bread-jam for breakfast, an electric kettle along with sugar, coffee and tea sachets… for all the people in the group who cannot start their day without a cup of tea / coffee and a few morsels in their tummy. And a newspaper… to aid a certain someone in certain early morning necessary deeds. A man has got to stimulate his brain for perfect motions!! The Sutlej mini-coach with its awkward size (nothing mini about a 30 seater) could not manoeuvre itself through the steep and narrow lane to our house to pick us all up. It was expecting too much of us to think we’d have carried the luggage to the bus. So, jiju did a few shuttle-trips with his Swift to the bus and back for the luggage and the lazy ones among us. The rest of us walked to the bus which contrary to what you might have thought was parked a mere 200 meters away. As expected from a luxury bus of its kind, the Sutlej was roomy and nice… and sparkling clean, smelled fresh and had all the usual stuff expected from these buses – fully reclinable seats, bone chilling AC, loud speaker system and the video-screen. The bus has a 2 + 1 arrangement of seats… and I chose one of the single seats at the back which had the largest window uninterrupted by the window-partitions. The seats had this slight forward tilt and it resulted in me sliding off to the seat edge many a time… I was saved from falling off because I have relatively long legs (I’d like to think so). The shorter ones on other seats had their bums sliding completely off the seat… so much for extra legroom! I was hoping to go to sleep as soon as I got in to the bus… evidently, that did not happen… I was wide awake the whole time. We had to make two en-route stops to pick up two (more) families of our relatives… in all we were 6 families plus or minus a few ‘kids’ being away on the account of not being in the country / no leave. I started getting a bit drowsy after crossing the Kerala border in to Tamil Nadu. By then it was early morning, and we had been in the bus for over 6 hours… we had to reach Mettupalayam station before 7:00 AM. The meter-gauge, steam powered train (which I like to call the ‘Toy Train’) would take us to Ooty from Mettupalayam and it was scheduled to leave at 7:00 AM for a 5 hour journey to Ooty Station. We reached Mettupalayam at around 5:30 AM and then freshened up at the station, had nice filter-kaapiand breakfast at the railway canteen. Maybe because I was hungry… the wada-sambhar I had was yummy. I even got papa to buy me a pack of some fried savoury snack – fried corn tubes which could be worn on the fingers and also a few lollipops. The train sans its engine was already waiting for us. We found our non-first-class seats in the middle compartment. The first one was the first class compartment which should have been booked as early as 6 months prior unlike us who booked it 3 weeks prior. Our tickets cost a mere 23 bucks per seat… I almost fell off laughing when I saw the ticket prices. BEST charges me more for a trip from Vashi to Chembur!! Someone told me that the first class tickets were 230 bucks per head… that too is quite measly. But then, the train was hardly what I had expected. It was worse than a state transport run ordinary bus… and the first class was a notch above, perhaps comparable to a BEST ordinary bus. 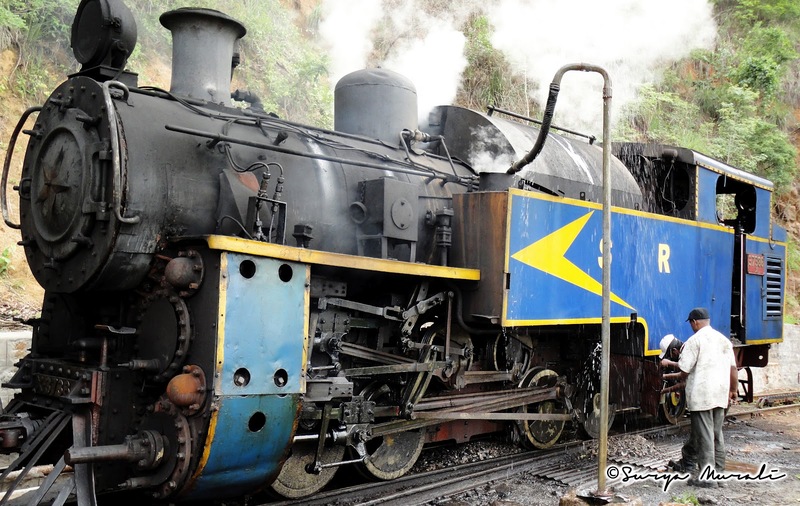 The train’s exterior was blue and yellow… bright and sunny! Here I was expecting polished wood interiors and the lingering memories of a vintage era… and what I got was the dirty sky-blue painted box of tin with grey Rexine seats. I am sure there were lingering memories of the earlier passengers but I did not check. I was glad we did not have to carry the mountain of luggage that we had brought from home in the train. Our nice and comfy bus was supposed to meet us at Ooty with our luggage. For a moment I did think I would have been better off getting to Ooty in that bus… not to mention I would surely beat the train in speed. 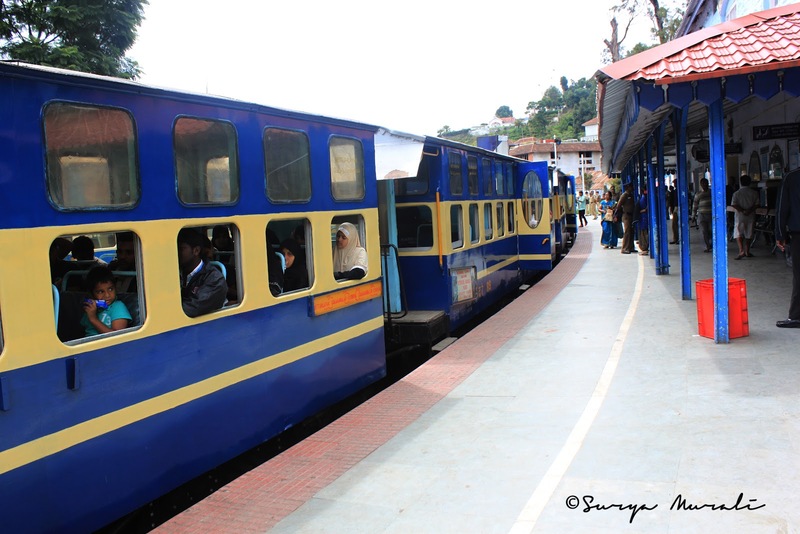 Of course, experiencing the toy-train was part of the Ooty deal and I wasn’t really gonna let go of that ‘opportunity’. Our compartment felt like it had sold of a few tickets more than it had seats and except for the seats which our group had booked, the others were quite crammed. We had the advantage of 4 kids (if that can be called an advantage) and then we also had two extra tickets because my brother and one of my cousins could not get leave for the trip. For all the leg room the bus provided, the train seats were stacked almost on top of each other. The seat in front of mine cut in to my knees. I silently thanked my stars for not making them seats reclinable. The steam engine chugged along and joined the three compartments and finally it was time for us to leave the station… and unlike Bombay’s local trains, if you were to adjust your clock according to this train’s timing then you’d be eating only dessert at most of your dinner appointments. Thanks for sharing this with us! Ooty is the ideal hill station for tourists to visit on any Tour to Tamil Nadu. One of the most popular tourist places in entire India, Ooty is a treasure trove of breathtaking natural beauty. The numerous tourist attractions in Ooty include the verdant hills, cascading waterfalls and sparkling brooks, dense forests, sprawling grasslands and extensive tea gardens. Tourist across the seas comes here to visit the amazing locations and for many travelers who prefer to stay at Hill View Resorts in Ooty. A very comprehensive article about Ooty indeed covering topics as diverse as sightseeing attractions and accessibility through rail. The best train for reaching Ooty have been mentioned and inputs have been provided into the destination’s local economy as well.